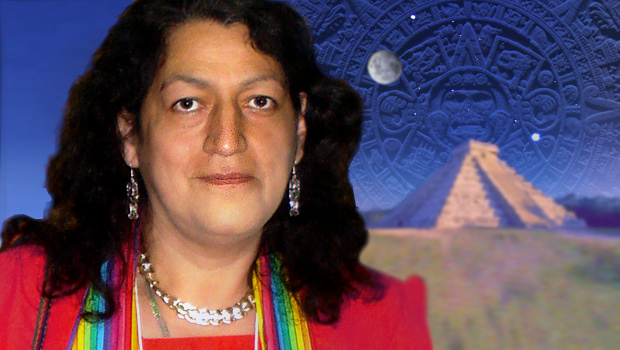 Gina Miranda Kingsley is a Meso-American Mayan Time Keeper. Gina is an expert on the Mayan Calendar a 5,000 year old vehicle of predictions and spirituality. The Mayan calendar is an ancient device filled with secret codes. Ancient Mayans were not only mystics, but they were scientists that delved into the origins of life. Her father was on the originators of the Sandinistas (a social democratic political party in Nicaragua). He was known as the “Jaguar Paw Commander” and was from the Mayans in Lake Atitlan, Guatemala. Because of his duties, he was never home and at the age of 3 Gina’s mother remarried. Her stepfather was a Lt. Colonel in the Honduran army and was physically and sexually abusive to her. When she was 9, her father heard of her abuse and attempted to rescue her from her situation so he came out of hiding. He was killed. When she was 11 she ran away from home in Honduras, destiny took her to the beach on the Caribbean Sea where the old shaman Ochi was waiting for her. This was the beginning of her training with him in the jungle and by the sea, day-in-and-day-out. She learned the Mayan calendar that he said was her destiny to learn. Today, her Shaman teacher Ochi comes to her in her dreams to explain complexities of the calendar to her that she has been attempting to figure out. As an adult, she witnessed the horrors of war in Nicaragua with the Red Cross and other philanthropic organizations, and due to unavoidable family ties to her father and her social activities in volunteering, she was imprisoned in Honduras. While in prison she was repeatedly tortured and raped and through grace, managed to escape. Her destiny eventually brought her to Minnesota. She holds a B.S. in Computer Science Programming and studied Anthropology, Marine Biology and Astronomy. Also this year, Gina was an adviser to the Mayan exhibit at the Minnesota Science Museum that is currently on display. Gina was featured in the Star Tribune this summer. Her blog called Mayacron, has more than 70,000 followers.